Flowering stems range from about 4 inches to 12 inches (10 to 30 cms) tall blooming in June and July. Seed ripens in September. Described as being "sporadically distributed" in its wild habitat. Pontus Wallstein in his book 'The Lily Species and their bulbs' reported that its native area around Lake Tianchi has been subject of a severe drought as has much of the Yunnan and in 2012, not a trace of L. souliei was to be found. Title photo copyright Alan Mitchell, all rights reserved. Used with permission. Thank you Alan for this wonderful example of L. souliei in nature. 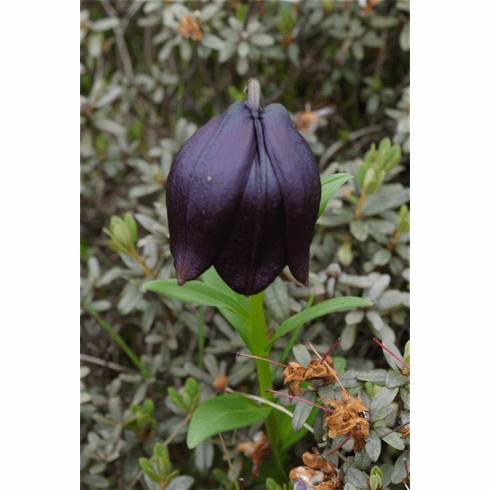 Photo inset #1 is shows nicely the throat of this rare and endangered lily. Photo courtesy of Wikimedia Commons and was taken by Ernst Gugel. Photo uncropped. Published under GNU Free Documentation License. Thank you Ernst for sharing this wonderful of an extremely rare lily photo on Wikimedia Commons. Photo inset #2 is also courtesy of Wikimedia Commons and was taken by Ernst Gugel of a more reddish form in habitat, Lake Tianchi, Yunnan, China. Photo was not cropped. Published under GNU Free Documentation License. Thank you Ernst for sharing this wonderful photo of an extremely rare lily on Wikimedia Commons.